On bare soil by stream. 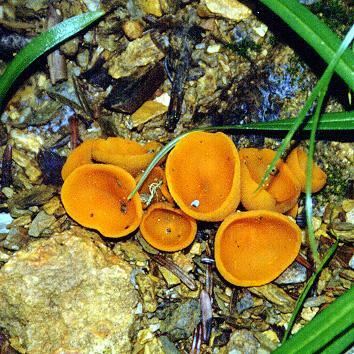 Cupulate, stipitate, hymenium orange, receptacle yellowish buff, ca. 20-50 mm in diam., outside slightly pustulate, ascospores ellipsoid to long-ellipsoid, biguttulate, reticulate, ca. 20-22 x 11-12 um.